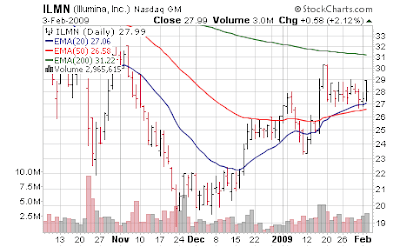 Illumina (ILMN) has been a holding with us for most of the life of the fund; this was beaten bloody and senseless late in 2008 although fundamentally nothing went wrong. Which is why this stock market is so difficult - owning stocks on fundamentals is not working for the vast majority of names. The company reported another good quarter last night and the beat goes on. Compared to competitor Affymetrix (AFFX) the company is hitting home run after home run. Yet you would of lost a similar amount of money owning each for much of the past year. Illumina Inc (ILMN), which makes tools for genetic analysis, posted better-than-expected quarterly results and forecast first-quarter outlook above analysts' estimates, even as other tool makers struggle with falling sales. The company said revenue during the fourth quarter rose 43 percent to $160.9 million, beating analysts' estimates of $154.4 million. It earned net income of $28.9 million, or 22 cents a share. Excluding stock compensation expense and other items, it earned 31 cents a share. We expect revenue for 2009 between $690 and $720 million, representing year-over-year growth between 20% and 26%. We expect our gross margin percentage to be in the mid 60s. We expect earnings per fully diluted share between $1.10 and $1.20. We expect the full year pro forma tax rate to be approximately 33% and stock compensation expense of approximately $60 million or a tax adjusted amount of $0.30 per fully diluted pro forma share. For the first quarter of 2009, we expect revenues between $158 and $164 million. We expect earnings per fully diluted share of $0.23 to $0.26 assuming approximately 131 million shares. We expect stock compensation expense during the first quarter of approximately $14 million or a tax adjusted amount of $0.07 per fully diluted pro forma share. Deutsche Bank analyst Ross Muken said Illumina posted a "very strong" quarter, with improved profit margins due to "exceptional" sales of consumable items. He maintained a "Buy" rating on the stock, and raised his price target to $41.50 per share from $36. "Illumina remains the clear leader in genetic analysis tools, with significant growth across all of its major platforms," he said. Cowen and Co. analyst Doug Schenkel said Illumina's instrument sales were better than he expected, and he noted that the company's forecast does not include any potential benefits from an economic stimulus bill, which could aid its results in the second half of the year. "We believe there continues to be ample room for upside over the course of the year," Schenkel wrote. Technically, the stock has been stable the past few weeks after a roller coaster ride of epic proportion. The stock is sitting over support ($26, $27) and resistance lies ahead in the $30s. Recent highs were around $30.25s so a breakout over that level and through 200 day moving average would bode well. Otherwise it's just another stock being daytraded by HAL9000 and friends, range bound and being batted around by a directionless market.